I know I’ve been quiet, and have sadly neglected my flash fiction story over the past couple of weeks. I’ve been completely swamped preparing my first role playing game module for Hydra Games (I can’t wait to tell you all about it!). But even the best projects need some time on the back burner, so we cut loose a bit last weekend. Unfortunately, the grocery store trip didn’t happen, and the liquor cabinet is getting pretty empty, so….we improvised. According to That’s the Spirit, a Tom Collins is a social drink, to be enjoyed with an “air of sophisticated nonchalance.” Nice! The classic recipe involves lemon juice, sugar, gin, and club soda. 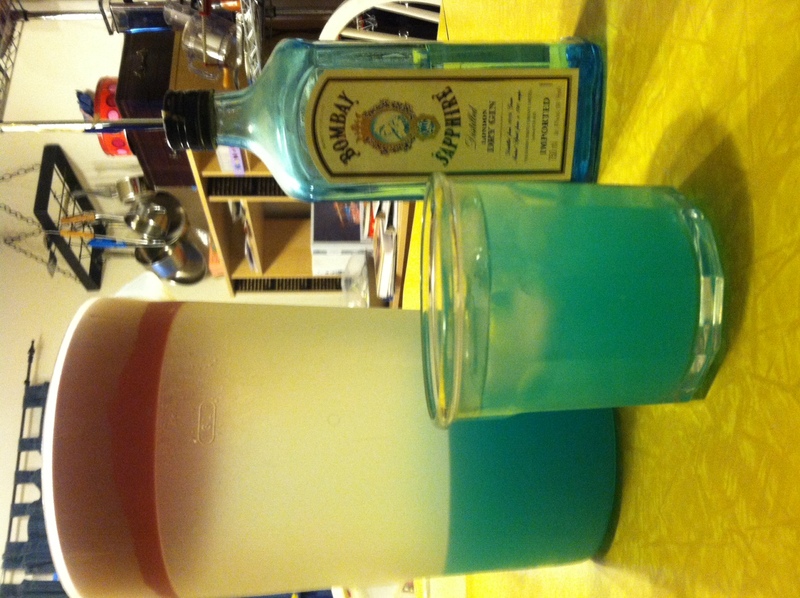 We had gin and the scary blue Kool Aid lemonade the kids wouldn’t even touch.